If you’ve read “Born to Run,” you don’t need me to tell you there’s a higher purpose for chia seeds than growing sprout-like “hair” on a clay sculpture of an animal. 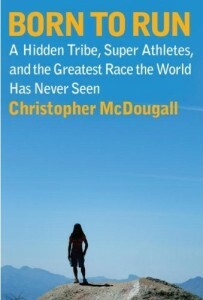 In the book, Christopher McDougall describes how chia fresca—chia seeds, water, citrus juice and honey—serve as a “home brewed Red Bull” for the Tarahumara, a tribe of natural superathletes in Mexico who routinely run 50 to 100 miles at a time. And that’s not where the seeds’ alleged super powers stop. Dr. Andrew Weil discusses the myriad health benefits of chia seeds in this Prevention magazine column. A Huffington Post story titled—no joke—”Change Your Life With Chia” rattles off even more healthy, almost miraculous, properties. What runner wouldn’t be curious? I picked up a pack of chia seeds at Whole Foods, and set out to make me some chia fresca. The more messageboards I read, the more freaked out I got. One runner after another raved about the delicious drink, which they almost unfailingly described as “slimy” and “gel-like.” Really, runners? Aren’t “slimy” and “delicious” mutually exclusive? Whisk the chia seeds into the water and allow them to soak for 10-15 minutes. Stir in lemon or lime juice and agave and whisk well. Drink immediately. Makes 1 serving. 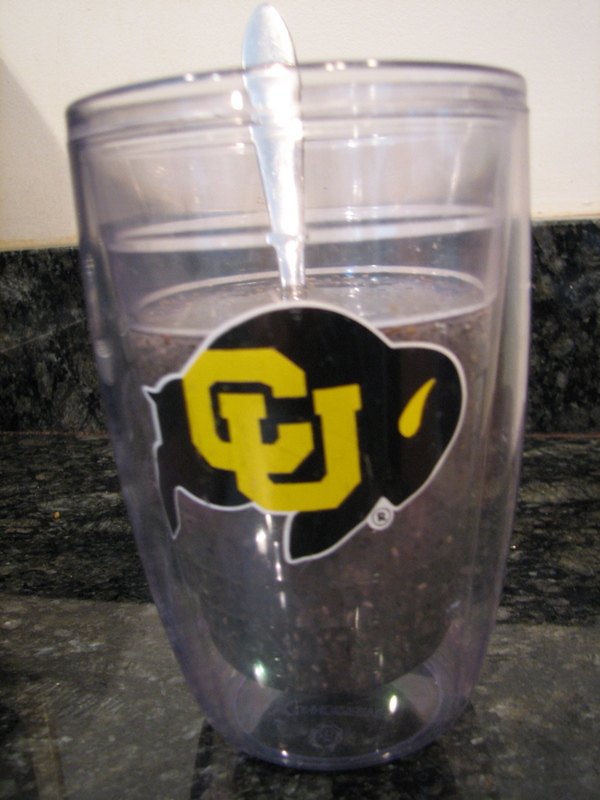 Anything is less scary in a CU cup. Guys, I tried. I really tried. And I almost vomited from the first sip. The gooey, slimy, chunky texture was just too much for me. I’m sure my opinion would be more favorable had a glass been given to me after 50-mile run through the Mexican desert, but in my kitchen before a swim at a DC pool, it’s a no-go. But as horrified as I was by chia fresca, I wasn’t going to give up on chia seeds. Weil recommends sprinkling them a salad or mixing them into yogurt, and I tried the latter a few hours before my run on Tuesday. I masked the seeds, which I was now thoroughly freaked out by, with almonds and Kashi cereal, plus some berries and peaches from this week’s CSA offerings. 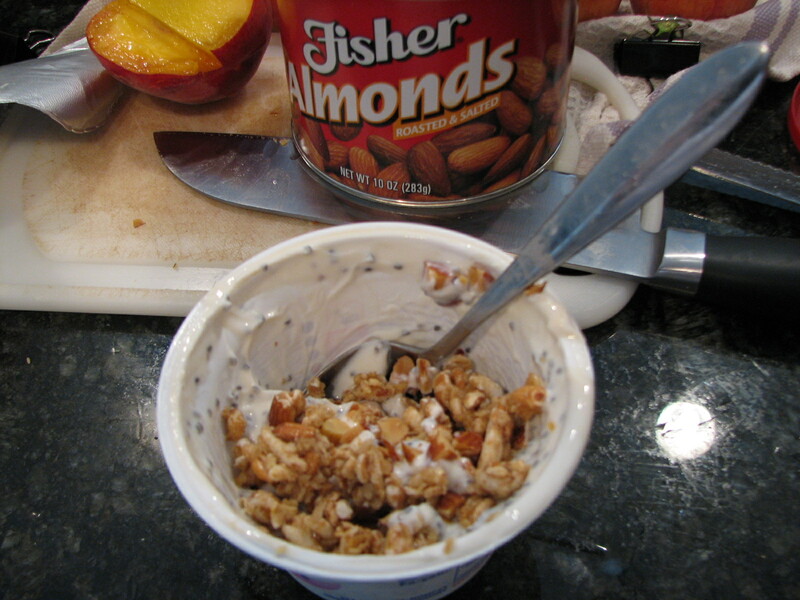 I kept adding stuff—almonds, cereal, fruit—until I forgot the chia seeds were in there. The jury’s still out. It tasted perfectly fine, but I’m not sure I felt any pronounced energy boost. My stomach felt a little gurgly during the run, but that likely has more to do with the uber-hilly route and the DC summer heat than the new fuel. 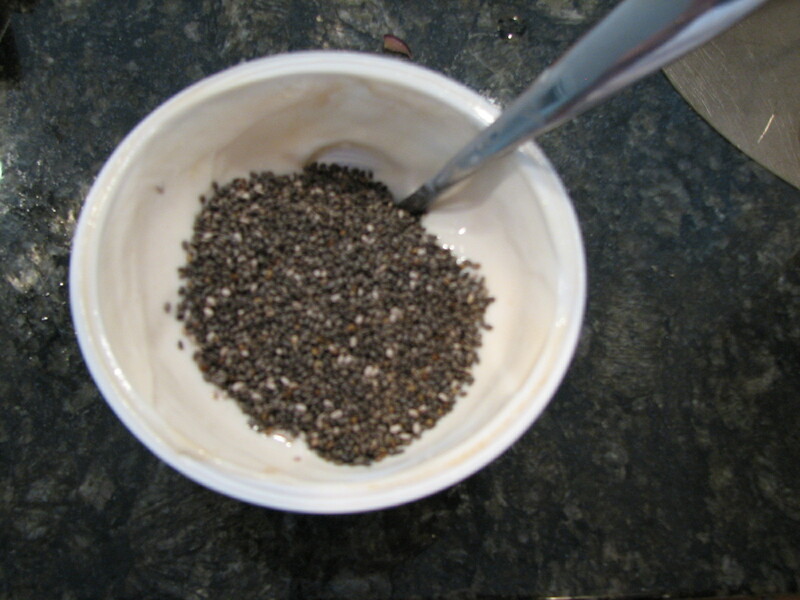 Next up: chia seeds in a smoothie, and chia energy bars, an idea I got from Matt at No Meat Athlete. Matt says he came to try this recipe to avoid the “little globs of chia snot” in chia fresca. Glad I’m not the only one! Do you use chia seeds? What in the world do you put them in to make them tasty? Is chia fresca an acquired taste (if you tell me you loved it from Day 1, I’ll never touch the stuff again)? try it in a smoothie, I’ve had better luck with that. And, in things like oatmeal, or baked in bread. Also, I’ve heard it’s sustained energy – you consume it 4 or 5 hours before your run. Not sure that part would work for me, I’m a every two hours eater. I’ve done the smoothie as well – it works pretty well for me that way. I don’t know that I could choke it down otherwise…especially out of a CU cup 😉 haha only kidding. Good luck with your Chia exploration! I just finished reading – Born To Run – today! What an inspirational read. Amy, we also have not quite become a fan of the drink. And we tried putting them in our shakes but they just stick to the sides of the blender mostly. I do mix them in with my morning museli mix often and I like the little crunch they add. We also bake “cookies” for our rides and runs, which work really well. Unfortunately, my recipes are going to be a little vague because we just kinda make it all up, but I hope these help! On a stove, toast a mix of cornmeal, almond meal and or flaxmeal (I actually haven’t tried the flaxmeal yet, but I intend to. I ususally do half-in-half of almond and corn meals in a small skillet). Watch carefully, it only takes about 5 minutes to toast and brown. In bowl, mix toasted meal with 1 tbsp of water at a time. Mix so its just barely all wet and pasty (not too wet). Bake for about 10-15mi at 350. Check every minute or 2 after 10 min…they should be somewhat soft but a darker brown on bottom. As they cool (and best to put in fridge overnight) they will get a little harder so they stick together, but still keep a “soft cookie” consistency so they are easy to eat and digest on runs/rides. You can also eat without baking, like a paste. Put in a small ziplock and squeeze! Feel free to email me if you have any other questions or suggestions…we are always playing with the recipes. My favorite way of eating it is like oatmeal. I put two tablespoons in a coffee mug. Add hot water. Stir like I would instant oatmeal. Sweeten with a little honey or agave. Add fresh fruit/berries. Energy packed meal to start the day! Can you try mixing them in bread & muffin mixes? similiar to what you’d do with flax seeds? Interested to keep hearing about these trials…I’ll pick up my share soon and contribute to the testing! I adore chia seeds!!! put them in almond/soy/rice/cow milk add cinnamon and sweetener (i love stevia) and let sit for 15 minutes. stir. It’s just like tapioca pudding except better!!! chocolate powder and mint are also delicious!! great source of calcium and omega 3s and protein! I would love to try this. How much of each do you put in the bowl? i’ve heard about the chia-water/gel/snot effect… not so sure about that one. i am definitely tempted to try it, they sure made it sound magical in the book! No thank you on the texture of soaked chia seeds. But I drink chia fresca every morning. I just soak them for 10 minutes, then throw them in the blender with some extra water, ice, lemon juice and agave. Way better! And as far as the energy, yes I have noticed a big difference (it also helps curb hunger, something that may be helpful during those longer runs). My iskiate was not slimey, but, I let two tablespoons of Chia in an 8 oz. glass of water sit overnight on counter (not refrigerator) and stirred it before going to bed and in morning. Quite a homogeneous mix. Added lime juice and packet of Splenda. Great Drink! Going to try previous blogger’s hot drink in the morning in coffee cup and seeds should dissolve lot faster in hot water. Ran further and faster after my glass of iskiate. I tried iskiate just as a drink, wound up cutting the amount of chia seeds to make it less jelly. Then I had a job last summer in Palm Springs, 105 degrees and dry. I’m 20 years older than the other guys, and the iskiate (full chia seeds this time, wait till they jell) kept me going long after everyone else was dying in the shade. I don’t think most of us are sweating enough to notice a huge difference. I just tried it and I feel like I washed down a caffeine pill with Dr. Pepper (yes, I did do that back in my misguided college days). 1 T whole chia seeds + juice from half a lemon + 32 ounces water in my nalgene — I’ve drunk about half so far. The extra water and gulping rather than sipping makes the seeds slide down easier. and not nearly as gross as drinking fish oil. and flax seeds are high in phytoestrogens which may cause hormonal imbalances in both sexes, lead to tumors in women. well alot of things contain phytoestrogens. so take a deep breath and just get over it already! I’ve been trying to incorporate these into my diet for years and I’m getting less skeeved by them. Honestly, they don’t taste bad, they’re just weird! Getting over that though, these are some of my more helpful experiences. First off, grind them. Seriously grind them up in a cheap coffee grinder, makes them a little easier to incorporate into things. As far as incorporating them into things, scrambled eggs mask them pretty well though they do make the eggs look a little funny. I actually love to make my own salad dressings and I’ve found that the best (and healthiest) way to make a thicker salad dressing is to add the chia seeds to it. They take on the flavor of the dressing and add a very slight crunch to your salad. It also works somewhat well in yogurt, though I use greek yogurt and it can be a little thick so adding some agave syrup to thin it out and sweeten it up a bit helps. Probably the easiest and most effective way I’ve had them thus far is by taking some natural peanut butter, nuking it for about a minute, then mixing the ground up chia seeds with it and spreading it on the vehicle of your choice (I use those popped rice cake things). I ate one of those about an hour and a half before working out and it made a significant boost in energy. And as far as energy, not only have I noticed a difference, but my friend who teaches the kettlebell classes I take has noticed a difference too. The dosage I use is a 15g scoop which comes out to be about 4 teaspoons of seeds. Hope this helps! This is SO helpful! I can totally see the peanut-butter trick working … and the salad dressing. Thanks for the ideas—they may just save the Amy-chia relationship for good! I have also ground chia/flax in a coffee grinder for an egg substitute in GF baking – usually grind just before use, as they have unsaturated oils that can go rancid quickly – works great! 1/3 C OG applesauce, 1/3 C coconut milk kefir, 2 Tbsp frozen raspberries, shaved; 1 tsp honey, 1 tsp coconut oil, 1 tsp Grade B Maple syrup, 2 Tbsp Chi seeds. Stir all these together, & let sit 30 minutes. I am making a ‘breakfast bowl’ rather than a smoothie today. Hi All, I also read the book, bought my seeds from livesuperfoods.com. I agree most of the above, gooey yes, but that stuff doesn’t bother me as long as I know it’s beneficial. But, because it can absorb water 9 to 12 times it weight it can make your stomach gurgle, if it’s your first meal of the day. If not soaked in water or juice etc. So keep that in mind. Also I don’t feel a boost, it’s more of a steady energy unlike coffee, or something filled with sugar. Hope this helps. yeah, i tried to “sprout” the chia seeds. wotta mess. so here is “granola” recipe that i developed using as many antioxidant grains i could find in the cupboard. the result is very tasty without being overly sweet or gooey……. place 2 cups almonds, 1 cup pepitas, 1 cup sunflower seeds, 1/4 cup flax seeds and 1/4 cup chia seeds in a big bowl and cover (maybe 1/2 inch over the tops) with refined water. leave overnight at room temp. cover 1 cup currants in warm water (just to the top) and soak overnight in the refrigerator. so, in the morning, you will have this lovely mass that looks like the “blob” rolled over a food coop. no worries! add 1 cup chopped pecans, and 1/2 cup macademias. throw the currants and their soaking water in a blender, add 1 tablespoon pure vanilla, 1/2 teaspoon high-quality ground cinnamon, 1/2 teaspoon ground cardamom and 1/4 teaspoon cayenne and puree until smooth. add the pureed currant mix to the messy nut mix in the big bowl and combine well. cover a baking pan (i use a big cookie sheet with a raised edge) with parchment paper so there is overlap by about 2 inches on each side. dump the contents of the bowl onto the parchment paper and smooth over. place in a 170 degree oven overnight. the next day, take the pan out of the oven. you should find a lovely toasty somewhat pliable brick. if not, leave in the oven until it firms up more. flip the brick onto a fresh sheet of parchment paper, back onto the pan, and back into the oven for another 2 hours.i just turn the oven off and leave the pan in there to cool slowly. the brick should be dry and crisp and easily broken off into small chunks. it goes well with bulgarian yogurt and fresh berries in the morning and makes a great trail mix for hiking. I keep it in an airtight container in the refrigerator because i don’t know what its shelf life is. be sure to drink lots of water or fluids with this mix as it is a very dense and potentially cloying food. Try blending the chia fresca. That’s what I do and it gives it a more fluid consistency. I love it that way. I guess those of you who have trouble with the consistency of chia fresca probably don’t like bubble teas? I eat chia seeds with yogurt, on pasta, in bread, in salads, anything, really. And just eating a few spoonfuls on their own fills me up like a small meal. It’s great! I use chia seeds in a hot “cereal” recipe that I make (I low carb, so I don’t do oatmeal), and it’s seriously amazing. It tastes like a mushed up piece of pumpkin pie. Beat the egg well, add the milk and pumpkin and mix. Stir in chia seeds, and let sit in the fridge for 20 minutes or more. You can even let it sit overnight – according to the USDA, an uncooked, beaten egg will last in the fridge about 3 days. When you’re ready to cook, stir in the almond meal. (I don’t know that you need to wait to add it, but I’m afraid it would get mushy if it sat in the liquid for too long.) Melt a smidge of butter in a small pan over medium heat, then pour in the pumpkin mix. Cook for about 5 minutes, stirring occasionally like you would with scrambled eggs. Pour into a bowl, add sweetener, and serve. There is absolutely nothing slimy or gooey about this – the egg and the almond meal help to thicken it up and give it some texture. It’s also totally delicious – everyone in my family, including my 5- and 9-year old, loves it. Oh hay that pumpkin pudding sounds awesome! I definitely have to try that, especially since I always have pumpkin in my pantry. I love the Chia seed . people that are grossed out think of it this way . your drinking special life force that with each sip your body becomes more alive. I like the taste and your bringing a life force into your body . try getting that from a coca cola. I just got a bag of chia seeds off Amazon after trying a…I think it was cherry flavored…kombucha that I got at MOM’s. After some experiments with concentration and stirring methods, I figured out that constantly stirring for about a minute, then letting it set, gets rid of the clumps. Still trying to figure out how to automate that. I wasn’t a huge fan of lemon chia fresca, but with watered-down unsweetened cranberry juice instead, it was delicious. And Thanksgiving appropriate! I’ve also found that putting some in my morning tea gets rid of the snot problem; the clumps are still there, but they taste like tea instead of …slime. If you don’t like boba tea you might not want to try it, but otherwise it’s pretty good. I’ve eaten Chia Seed Pudding for several years and didn’t realize it was “hard to swallow” as most everyone loves it. I just tried the Chia Fresca recipe using frozen cranberry concentrate as I don’t have any lemon in the house. I think where you might have mitigated the taste toward “tasty” instead of a “gelatinous mess” is by stirring the chia seeds in water immediately, add the other ingredients to your taste, stir again, wait about 10 minutes and blend before drinking. No clumps, snot or seeds stuck in your teeth. If you can’t deal with this, go sit on the couch and watch TV! I love chia. I have a chia drink every morning. I put it in apple juice, v8 fusion, orange juice. I noticed a huge decline in my a1c and blood sugar. I also noticed a noticeable change in my cholesterol. That said, I decided to incorporate it into my husbands life too. I put it in our soup after it’s put in the serving bowl, I put it in hot cocoa and also sprinkle it on pizza. He doesn’t mind it at all. I am amazed at the negative comments regarding the texture of chia seeds. I love chia seeds and make a type of chia fresca using coconut &,almond milk, honey, cinnamon, and chia seeds. I bring the ingredients to a boil & then let sit for about 10 minutes. It is delicious. If there is a lot it’s refrigerated for later. At times I add a little nutritional yeast for extra benefit. I also add the chia seeds to soups. Just tried the chia fresca and LOVED IT. I, too, was surprised the so many hate the texture. I didn’t have any problem with it :). I added lime juice and sweetened with liquid stevia. Can’t wait to try it in milk as another suggested. I just had my first glass! I put my chia seeds in water last night, and this morning dumped some sugar in and a half of a lime. I love it! I’ll have to wait awhile to see if there is any energy boost, but it was very soothing to my hangover at least. Pingback: New To Me: Chia Seeds « Racy Stacie: A training journey. Drink it with a a straw.much easier. I make a raspberry green tea,2 tbsp.chia,1tsp. Honey and sparkling water to mix. Devine! 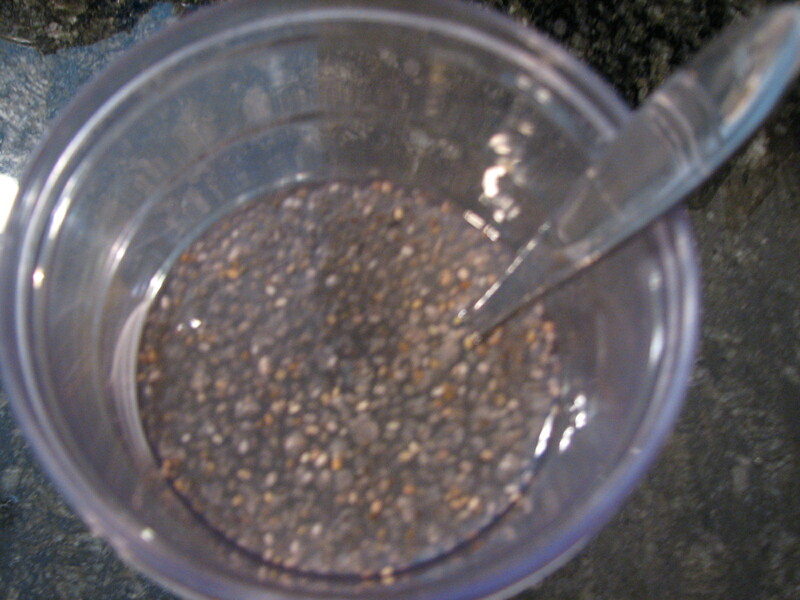 The traditional recipes for Chia Fresca call for 9 cups of water to 1 T of chia seeds. I would think that is why it seemed so slimey. It was more of a pudding than an energy drink. You could make a small test batch by putting 1/2 tsp or less chia seeds in a cup or so of water and the honey, lime or whatever you decide to mix it with and see if it is more palatable. If you like it, then mix up bigger batches as it will keep in the fridge for about a week from what I understand.Then get the daily amount (2 T.) of Chia with the other methods described above. If you plan on using Chia fresca on an extended run or workout session, add another 8 to 10 oz. of water to the chia gel. Since chia seeds are so absorbent, they could potentially dehydrate your body if not accompanied by ample water. I just tried my first ever Chia seeds. To test the ‘gloopiness’ for myself I simply soaked a bunch of seeds in a glass for a couple of hours and drunk the lot without any addatives. It had a neutral taste (If any) and the texture wasn’t off-putting at all. I can hardly wait for more! I mix a 1-2 tblsp chia with a cup of water and let it set overnight. It turns in a gelatin, this is my chia concentrate. Then when I want a glass of Chia Fresca I use 2 tblsp of the concerntrate in a glass of water with the lime and other ingredients and it is great. I use as much or as little as I want when ever I need an energy boost. Sometimes I just add a tablespoon in a smoothie. The concerntrate lasts about a week and then I make another batch. It is very good that way. Of smoothie come desert drink. Mix well and leave it in the fridge to chill n gloop up. Stir it each time you drink it. Sort of like semolina. For all worried about the texture and not able to drink….why are you waiting until it gets thick??? You don’t have to! I put on my drinks and drink it right away and it gives me a full sensation so I eat less, and it does give me energy too I love it, you can Aldo add to bread recipes for moisture. I don’t know what everybody is so squeamish about. I bet some of you folks faint at the sight of blood. Although I admit the look of chia fresca is totally disgusting, you just need to get past that part. Your brain is telling you that if it looks disgusting, it must taste disgusting. It doesn’t. Try this: Take a bottle of water, and take a big slug. Add 2 tablespoons of chia seeds and one sleeve of Crystal light lemonade mix… any less than that and you are just wasting your time. Shake the stuff up every few minutes for the next 15 minutes, then put it in the refrigerator for about 12 hours. Then just give it a shake and woof it down. Chia Fresca is the easiest way to ingest a sufficient amouint to realize any benefits. Sprinkling on salads or oatmeal just doesn’t give you enough, and is a waste of time. I’m real sick of everyone basically saying if you don’t like the texture you’re a pansy. It’s totally unnecessary (not to mention unhelpful) to scoff at the experiences of others. I simply don’t like crap floating in my drinks (except ice). In any case, I’ve been eating the stuff for years (I eat about 15g at a time) and I still don’t like the texture, it has nothing to do with what my eyes are telling my brain. It also doesn’t stop me from eating it. I simply gave my opinion on how to deal with something I find rather unpleasant. And no, blood doesn’t bother me. Seriously, here is a blog where someone (Amy) knows the benefits of chia seeds and has a problem with the sliminess or gloopyness and is asking for hints around this. Stating that you love them and if others can’t get over it is plainly inconsiderate and shows how much you actually read the article. Helpful suggestions were for the asking not pompous attitudes. Sorry, Amy. I started playing around with chia seeds after watching Hungry for Change. I mixed them in juice and chugged them down. In organic orange juice spiked with a bit of raw cranberry it feels like super pulpy OJ. After reading Born to Run I decided to try the much lower sugar option and started whipping up chia fresca wherever I could get the components together. I have texture issues with some foods (mayonnaise, avocado), but I absolutely love the little balls of snot. When I make it you can hardly see the water for the chia seeds.